I have earlier blogged on Lubria Polo (Persian Green Bean Rice) which uses Saffron as spice. I am fascinated with this spice because I have been told that this is the most expensive spice by weight in the world. 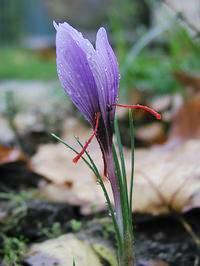 Saffron is a spice derived from the flower saffron crocus. Each of the flowers has three stigmas. The stigmas and the stalk connecting the stigmas to the rest of the plant are often dried and used in cooking as a seasoning and colouring agent. Saffron, which has for decades been the world’s most expensive spice by weight, is native to Southwest Asia. It was first cultivated in the vicinity of Greece. 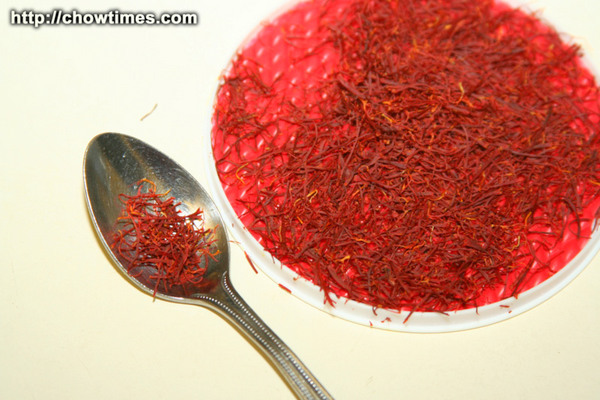 Saffron is characterized by a bitter taste and hay-like fragrance. It also contains a dye that gives food a rich golden-yellow hue. These traits make saffron a much-sought ingredient in many foods worldwide. Saffron also has been known to have medicinal applications. I was told that I could only get saffron from a Persian grocery store. There is only one Persian grocery store that I know of in Richmond — it is called Sahand Supermarket in Westminster and Minoru. Sahand has only one brand which is kept behind the counter and not on the shelves. You got to ask them for it. 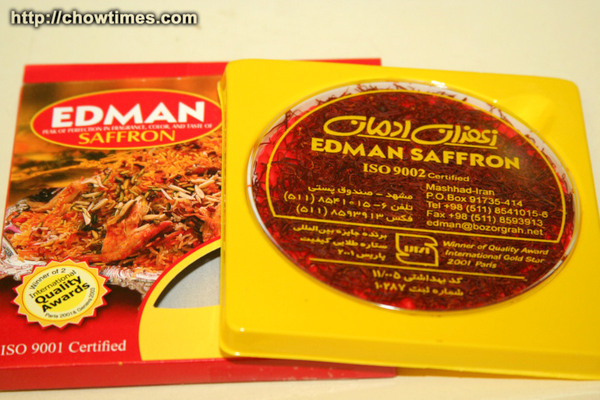 The Edman Saffron costs $4.99. See the pack below. Suanne and I went to a new place for lunch. For those of you familiar with the Willingdon/Moscorp area in Burnaby, you might know of where the Orchid Delight Singaporean restaurant used to be. It seems like Orchid Delight had closed and in it’s place is this new Taiwanese Beef Noodle House. The restaurant is simply called No 1 Beef Noodle House. We were very impressed with the changes that the owner made to the interior. It was very modern and upbeat. 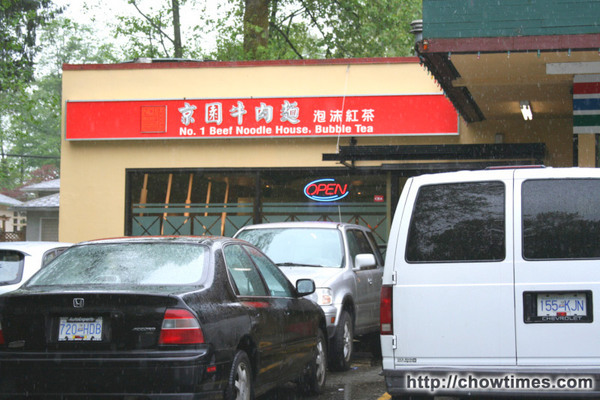 The address of this restaurant is 4741 Willingdon Ave, Burnaby. You know, I highly recommend you checking out this restaurant. What we like about this restaurant was that not only the food was excellent but the price was very OK. The restaurant is clean and the service was prompt. We were surprised how busy the place was even though it was newly opened. There is a wait for tables at the peak of lunch time — very much like what you see in dim sum restaurants on a weekend. The bad thing about this restaurant is that parking is a challenge at peak lunch hour. 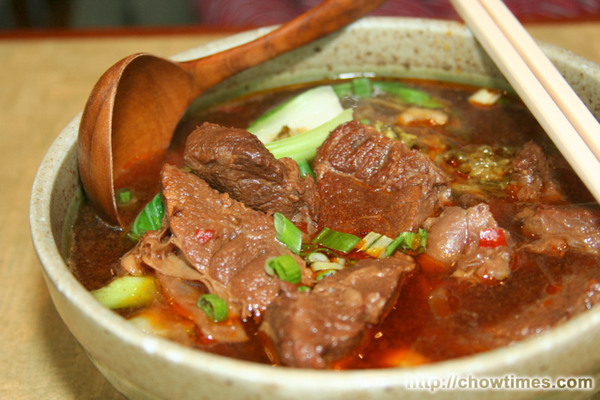 Suanne ordered their popular dish — the Beef Brisket Noodle in Spicy Soup which costs $6.25. There were big chucks of beef brisket which was quite tender. What we like about the way this is served is that they provided a deep wooden spoon — just excellent for slurping the spicy soup. 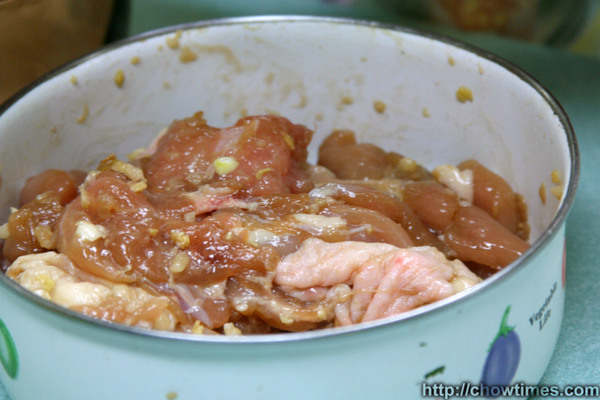 We wanted to make drunken chicken but never knew how to really make it. We have always enjoyed the soupy type of drunken chicken and so we did a search on the internet for recipes of this dish. 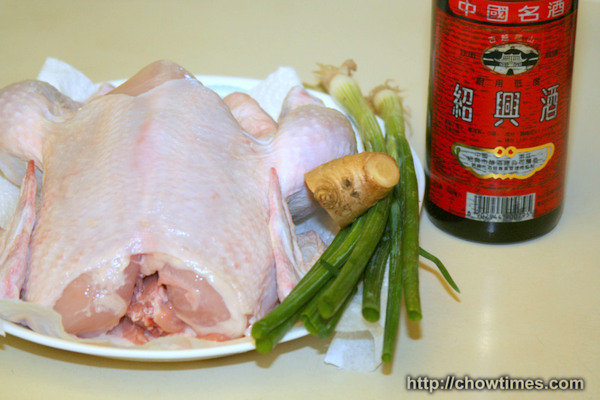 We were quite surprised how many versions of drunken chicken there are out there. Here is one that sounded simple and delicious. 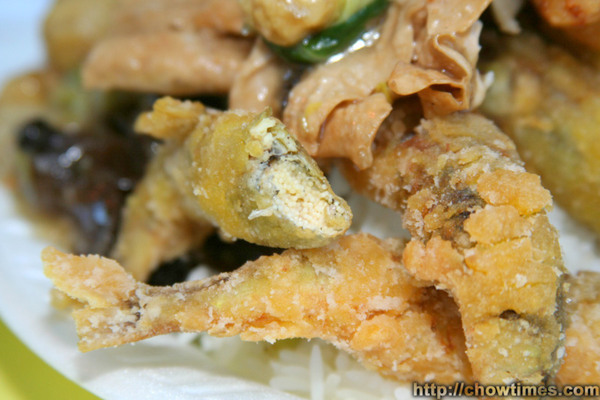 The one we found is a popular Chinese appetizer which is recommended served cold. I am not sure why it is called an appetizer but the amount of meat does not really qualify this as a appetizer but more of a main meal. Anyway, I prefer to serve it warm with rice for dinner. 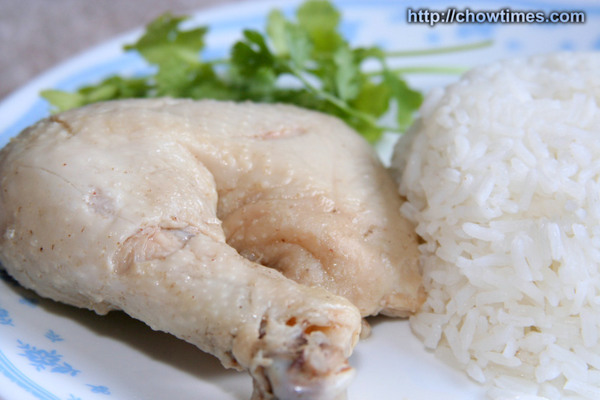 This is very much like every popular Hainanese Chicken Rice with a touch of Chinese cooking wine. Bring a large pot of water to a boil. Add the ginger, green onion, and salt and boil for a few minutes. This is to add a tinge of flavour. Add the chicken which has been washed and dried (with paper towels) into the pot and simmer for 30 minutes. Turn off the heat and allow the chicken to cool in the broth. That’s the whole cooking done. Drain the bird. I leave it for a few minutes until it does not drip anymore. 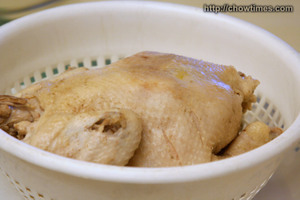 At this point you can cut the chicken in half, quarters or eight pieces (2 pieces for the wings, 4 for the legs, 2 for the breast and discard the back). 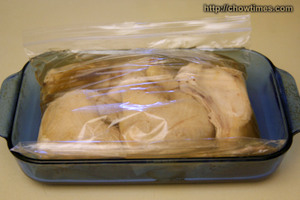 Place the chicken pieces into a jar (I used a ziplock bag instead) and cover with sherry. Keep refrigerated for several days. I started serving it after just two days in the refrigerator. Before serving, cut into bite-sized pieces. Serve cold. Garnish with cilantro if desired.Variation: you can save some of the broth from boiling the chicken and mix it with the sherry to cover the chicken if you do want it too heavy in wine flavour. Frankly, it’s not too bad but I wasn’t too pleased with it. Perhaps Ben always expected such chicken to be a bit salty but this is not at all. At least, it does look nice to me. 🙂 Let me know what you think. Anyone has a good recipe for a drunken chicken — send it my way and I’ll try it out … just make sure that it’s a simple recipe! 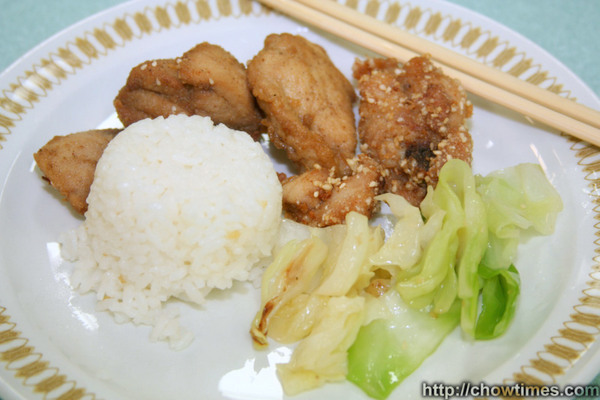 In this week’s cooking club, Julie from Taiwan showed us three different way of making fried chicken. She made a chicken scallopini and two sesame chicken dishes. She made a scrumptious lunch for us. We normally don’t buy such Asian drinks. I mean, I am always unsure of what goes into making these colourful and too-nice-smell-to-be-true kind of drinks. When we went to the Smart-N-Save store in the Lansdowne Mall, Vincent told us we simply must try this out. It’s called Ice Cool Sports Drinks. Each bottle costs $1.50. 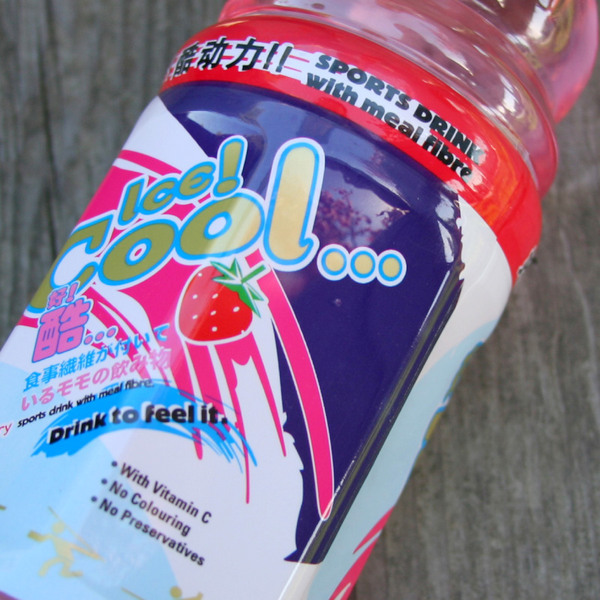 The markings on the bottle said that it’s a sports drink with “meal fibre” with a slogan “drink to feel it”. 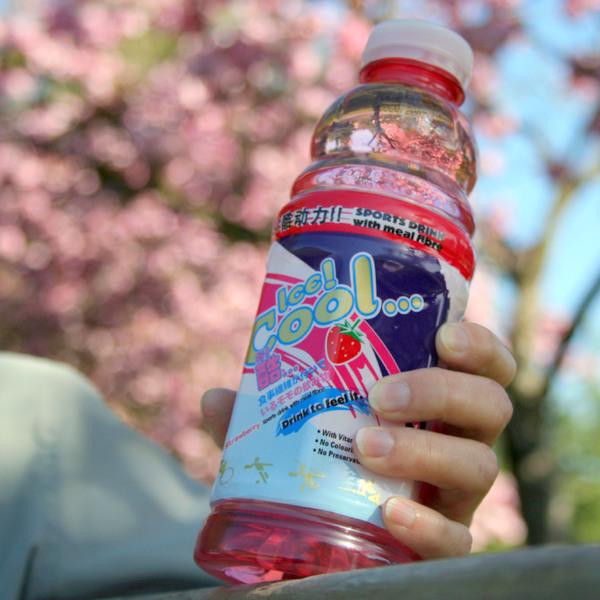 From the outside, it seems like just another pinkish clear drink. However, when we drink it, there were a lot of gelatin — we can’t see it but it’s there. You know, I won’t call this a sports drink at any rate. I would however describe this as a fun drink. The kids will like it and is great for outdoor parties. For some reason, I am thinking of seafood – specifically smelt and crabs. So, I went to the Richmond Public Market because their food is so cheap. I like smelt especially the ones with roes. I’ve Suanne to make it at home but we just can’t find such smelt (with roes). Anyone knows where to get them? I see a lot of smelt in the supermarket selling frozen smelt but they all are not pregnant. 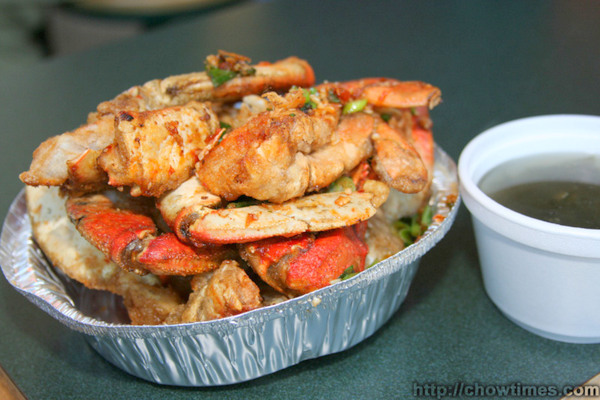 I also got myself some crabs — salt and pepper crabs. Each dish costs $6. It looks good but there’s very little meat and is a bit too dry on some part. You know, we can cook crabs ourselves but it’s just that we have never cut up a live crab before. Suanne don’t mind cooking and she had some recipes at hand too but her condition is that I do the killing. 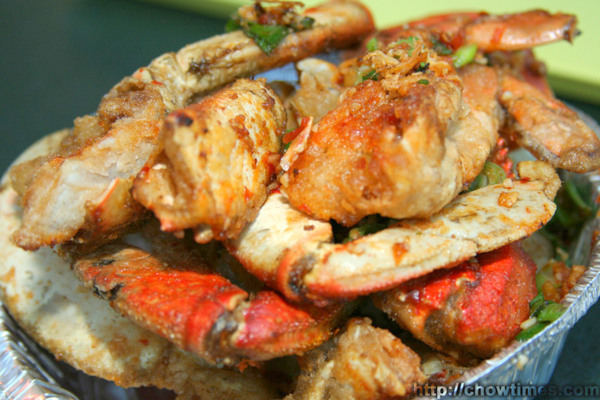 Can someone tell me what is the proper way to cut up a live crab? Ben started biking to work again having been driving to work for the past three months. He did not say it but I think he’s doing it because of the price of gas these days. Gosh! It is $1.16 per litre today. To think that just a couple of months ago, anything over $1 were considered outrageous. 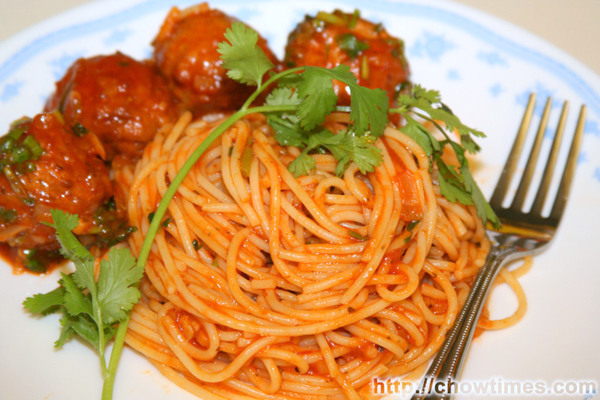 Anyway, knowing that he would want to carbo-load with his biking and all, I thought I make good old meatball spaghetti. Arkensen and Nanzaro loves that too. I like to add lots of chopped onions and garlic and with liberal sprinkle of Parmesan. 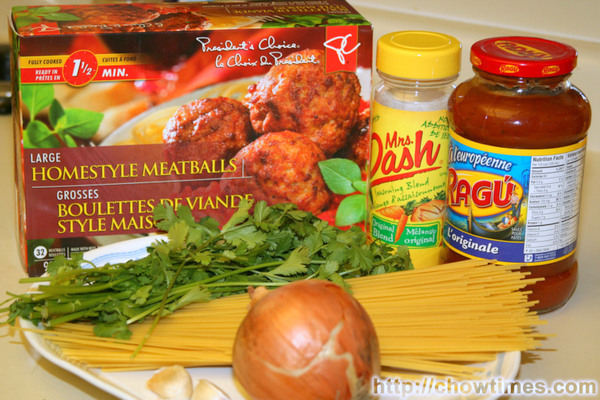 I learned to make spaghetti only when we got to Canada and did it my way. So, I am not very sure if this is the “normal” way spaghetti was made. Let me know if I am doing differently from the way you make it — I would most certainly want to learn from you. I stumbled on a good deal the other day at Save-On-Foods. The Prime Ribs were on special — just $18 for the three pounds of prime ribs. I recall the last time we bought it, it was something like almost $30. With oven roasts, preparation is really simple and the dinner cooks unattended. 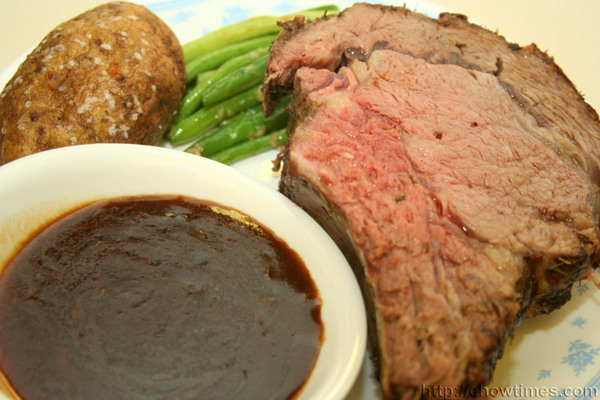 Although I made this only for the family this time, premium oven roasts are wonderful for the special occasions and for those times you want to impress. 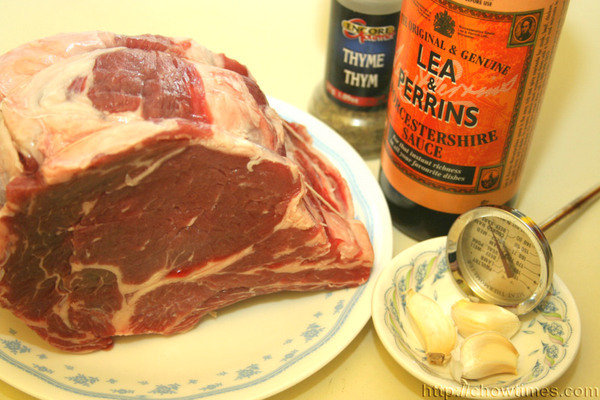 To add flavour I insert garlic slivers all over the roasts. This is a favourite breakfast of Ben’s. He’s a light eater as far as breakfasts goes and this Garlic Bread is just right. 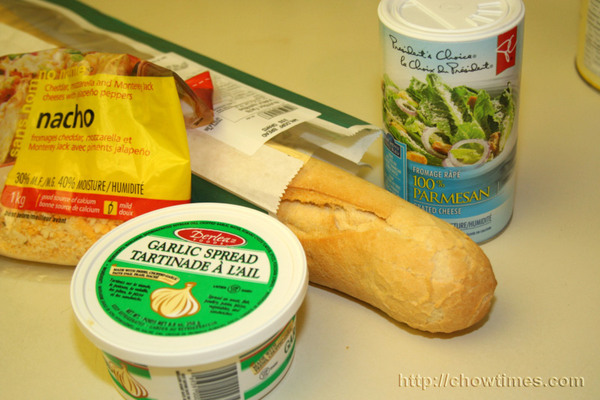 I use the baguette because it is hard and crusty — perfect when toasted. 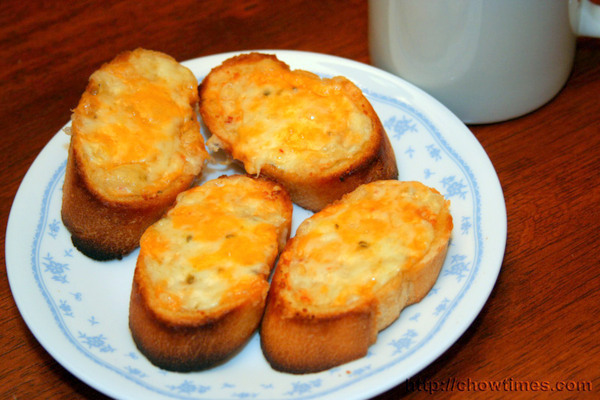 The garlic spread, Parmesan and cheese gives it the extra kick. 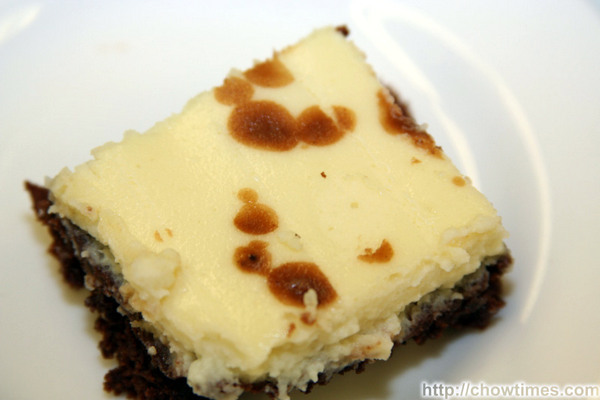 The second recipe which Minoo shared with the cooking club is a decadent cheesecake brownies. These rich and creamy brownies have less than half the fat of regular cheesecake brownies.